Got Jesus? Got faith? Got children, grandchildren, relatives and friends who no longer go to church? DID YOU KNOW: Your feelings about empty family pews are a call to prayer? That there are many lasting ways to share your faith with loved ones? That recording your spiritual journey will help you discover God and share faith in new ways? Picture your loved ones in the pew and in God’s arms. Share Faith! Evangelize: Here are 16 ways to begin. 1. Pray with photos of a family member. Picture Jesus beside your loved one. Watch for signs of God’s love. Thank God for one thing about each loved one as you pray for them. Picture this person in the pew beside you as you pray for them on Sundays. Or create “family” prayer cards. 2. Create a photo book about the way that First Communion or Baptism has been celebrated in your family. 3. Review a spiritual diary or start one. Chose a few entries to share in a Christmas or birthday letter, or on the anniversary of a loved one’s death. 4. All generations share a love of story. It is only the preferred format for the stories that differ. 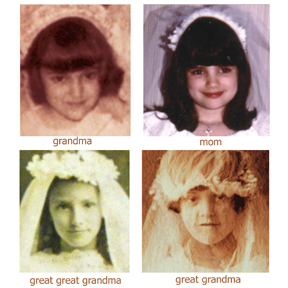 Ask a grandchild, niece or nephew to help you record the stories behind your oldest photos; either in audio, video, written, or in a photo tribute format. 5. Use a voice recorder to interview older family members. Be sure to ask silly, serious and spiritual questions. Transcribe what they share, or use audio files (with permission) during a family reunion. 6. Record what you admire about your parents, grandparents, great grandparents. Don’t let their stories and their faith disappear. Share why each one inspires you. Gather mini-bios of several of them into a booklet. 7. Write an ethical will, based on a favorite Scripture passage. Describe your faith, your values, and your spiritual desires for your family. Make arrangements for sharing this will after your passing. 8. Use a voice recorder to interview older family members. Be sure to ask silly, serious and spiritual questions. Transcribe what they share or use the audio files during a family reunion. 8. Design a booklet about your family’s involvement in your particular neighborhood parish, including as many generations as possible. Share what was it like to worship there? What meaningful memories do you have of Masses, Christmas morning, Easter celebrations, or parish gatherings and neighborhood friendships. 9. Label old family photos with a friend or family member. Keep a diary of what it has been like for you to look at the photos. Scan the most important ones to give as holiday gifts. 10. Try a “Dads Used to Be Kids” or a “Moms Used to Be Girls” book for a grandchild, with childhood photos of a grown child. Include what you liked about this child. Share an experience of God’s love for him or her. 11. Gather a group of friends for a workshop on creating a family spiritual history. Ask a personal historian to help you create a plan for your group. 12. Compile a family cookbook with traditional recipes & a few “spiritual” recipes, like one for forgiveness. 13. Learn how to share God’s presence in your life and in your family’s defining moments. 14. Combine an obituary and a brief biography for deceased family members on www.findagrave.com or write a prayerful eulogy. (Enter the name “Lillian R. Howard” to see a sample at findagrave.com). 15. Create a timeline that includes important moments in your life, your parents and grandparents’ lives. Share family responses to important events like World War II. Include the ways these events changed your family’s outlook and their understanding of the meaning of life. Share what role God played in helping you cope. 16. Gather your family to sing religious Christmas Carols, or incorporate carols into an existing holiday event. Invite people to share what they thought of ‘Baby Jesus’, as well as Santa when they were young. End with a few thank you prayers for gifts, decorations, Masses, traditions, meals, etc.